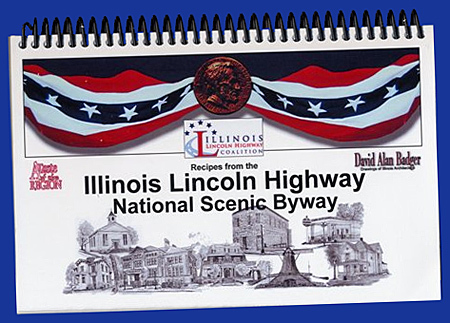 David Alan Badger has been gathering recipes from businesses along the Lincoln Highway in Illinois and combining them with pencil drawings of the businesses to produce Recipes from the Illinois Lincoln Highway National Scenic Byway. The book includes sections for each community along the route, plus a special section on the ILHC’s Interpretive Gazebos and Murals. Learn more about the recipes book at www.drivelincolnhighway.com, which includes a list of the communities. You can also visit www.davidalanbadger.com to see more of Badger’s artwork. This entry was posted on October 30, 2010 at 1:00 pm and is filed under food, highways, history, Lincoln Highway, travel. You can follow any responses to this entry through the RSS 2.0 feed. You can leave a response, or trackback from your own site.